It was here on this very night, that I learnt about the Hummingbird Bakery. I was in London recently, I went to Notting Hill, I ate on Portobello Road and yet I had no idea about this bakery. Turns out, with a little help from their cookbook (here), you can enjoy their cupcakes anywhere in the world. 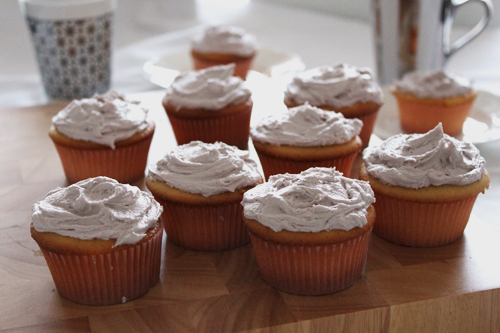 Sarah made the Lavender Cupcakes, and although the concept might seem a little strange, they work - brilliantly in fact. These particular cupcakes have the softest, sponge-like cake, and the icing is buttery and light – so much better than my last attempt at making cupcakes. With this recipe the only thing I altered was I used plain milk in the batter instead of lavender infused milk. I was making it for people who gave me a worried look when I said “lavender cupcakes”, so used the lavender in only the icing. They were still delicious, and the fragrance was subtle. If your wondering where to buy dried lavender, try a tea shop. I bought mine from T2 after calling a few health food stores and having no luck (try buying an organic dried lavender if possible). This cupcake recipe is going to become my new favourite. As I was eating one I started thinking about different combinations, like using a passionfruit pulp concentrate in the icing. Oh yes, there was one downfall to the recipe. For some reason I only had enough batter to make 10 instead of the stated 12. I’m not sure why this was. Maybe I didn’t beat it long enough – all I know is it was an amazing 10 so I was happy either way. I’m going to make some more of these and see what happens, if I get another 10, or more, or less. In two separate bowls (or cups) put the quantities of lavender and milk for the cake in one, and the measurements for the icing in the other bowl, and refrigerate for a few hours or overnight. Line a 12-hole cupcake tray with paper cases. Sift the flour, sugar, baking powder in a bowl, add the butter and beat on a slow speed until the butter has combined with the flour and you are left with a sandy texture. 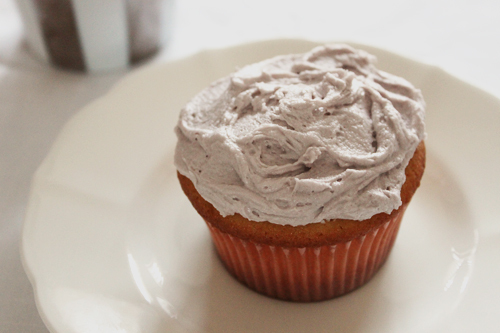 Strain the lavender from the milk (cupcake measurements) and slowly pour into the flour mixture while beating. Add the egg and continue beating, scrapping the bowl as you go. When all ingredients are combined, spoon the mixture into the paper cases until each case is two-thirds full. In a clean bowl, add the icing, butter and food colouring, and beat on a low speed until the mixtures comes together. Strain the lavender milk (icing measurements) and slowly pour into the icing mixture, beating as you go. When all is combined, beat on high for a further few minutes until the icing becomes light and fluffy. I really was unsure about this combination, never actually have I eaten lavender,but they were yummy. The sponge was perfect. Well done Tash...from your no 1 fan. The chocolate ones are going to be amazing! Cupcake overload lately.. The taste of lavendar was subtle but amazing, even when I added it to only the frosting and not the cake itself. Thank you for sharing it. :) I am wondering if adding some scraped vanilla bean seeds to this frosting would enhance its taste?